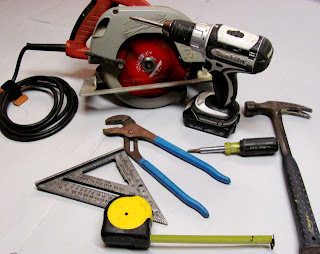 Whether you are a homeowner or just have a desire to build with these basic tools you will be able to accomplish most house hold repairs and endless small projects. Having the right tool for the job is very important when performing repairs of any type, this well-rounded set of tools will be enough for any homeowner to maintain their home or as the beginnings to a great tool collection. Buy quality tools, take good care of them, and they will last you a lifetime. It’s very hard to be accurate with no or a low quality measuring tape and accuracy will defiantly make home repairs more pleasant. I prefer Stanley’s Fat Max Tape mostly because of its strength and durability. A Cordless Drill is a must have these days. They can drill holes from a pinhole to 6” with the right bits and can drive any screw, nut or bolt. With the recent advancements in battery technology cordless drills have as much or more power than electric drills depending upon the models. For Drills I prefer Makita tools although there are many other good brands of drills. Drills and Impact Drivers is a previous post that provides a deeper look into this tool. Obviously everyone need a good hammer! I prefer a straight claw as a posed to a curved claw hammer. Not just because it looks cooler, but because it reaches under things easier. Pick on that matches your size and strength. Shaped like a right triangle this very handy tool has many useful marking already on it for marking angles and roof pitch. But mostly it allows you to mark straight lines and can serve as a guide for cutting. Having an all-In-one screwdriver is very handy. For the times when you have 3 different types of screws in one table, plus it’s less to carry and less to keep track of. Kline Tools would be my choice for screwdrivers. This sliding jaw type of wrench that can grab up to 2” diameter pipe. This tool is very handy for turning nuts and bolts to plumbing repairs. Every item on this list is available at Amazon.com where you will find the best prices on new tools. Buying used tools is also an option, Should I Buy Used Tools? Will answer any questions you have when buying used tools.